This is a pretty hat by leading milliner Emma B. 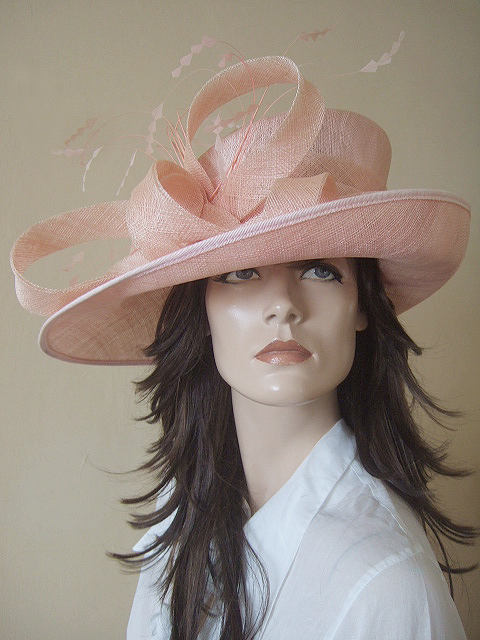 Beautiful pale pink, that will compliment many outfits in all tones of pinks, creams, greys or white. The brim has an upturn on one side, and gently down sweeps on the opposite. Decorated with large looped sinamay and sweetheart cut coque feathers..
£30.00 per day, plus £60.00 deposit refunded on return.